ATLANTIC CITY, N.J. — A former board member and four states that have had their licenses terminated by the Miss America Organization are suing the group and its top leaders, claiming "an illegal and bad-faith takeover" of the pageant. 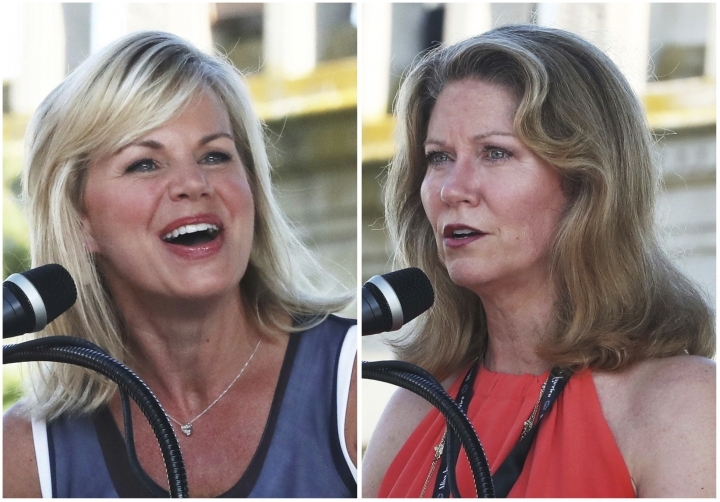 A lawsuit filed Wednesday in Atlantic City by Jennifer Vaden Barth and pageant organizations from Pennsylvania, Tennessee, West Virginia and Georgia asked a judge to void the actions of Chairwoman Gretchen Carlson and CEO Regina Hopper. It also seeks restoration of the situation that existed before the two assumed control of the Miss America Organization. The organization called the lawsuit meritless and part of "a yearlong orchestrated smear campaign." Numerous state organizations have been battling pageant leadership, citing dissatisfaction with the way the group is being run and with how a decision to eliminate the swimsuit competition from this year's pageant was reached. Carlson said opponents can sue all they want, but it won't bring swimsuits back to the Miss America pageant. "This is the first step in restoring the integrity and credibility of Miss America, which has been a cultural icon since 1921," said Vaden Barth, a former Miss North Carolina and former Miss America board member who has been among the most vocal critics of the group's current leadership. "They have characterized anyone who opposes their decisions and those who are resistant to national pageant changes, primarily the elimination of the iconic swimsuit competition, as troublemakers and a 'noisy minority,'" Vaden Barth said. "This could not be any farther from the truth." Carlson issued her own statement saying the organization dropped the swimsuit competition for well-documented reasons, including to make the pageant more relevant in today's society and to stop requiring young women to appear on stage in swimsuits and heels to try to win money for their education. "Certain directors who voted for the change later sought to seize control of the organization by spewing disinformation and aligning themselves with those who opposed the change," Carlson said. "These people have seriously harmed an organization they profess to care about, and have personally maligned its leadership as part of a scheme to take power and turn back the clock. Lawsuits will not reinstate swimsuits." The Miss America Organization called the lawsuit a baseless move by "disgruntled and conflicted former directors who have little understanding of nonprofit governance." "The Miss America Organization welcomes and respects differing opinions and encourages healthy and respectful debate on how best to pursue positive change," the statement read. "However, the ongoing baseless attacks driven by ulterior motives masquerading as altruism damage the organization and cannot continue." The litigation comes amid an ongoing struggle by state-level organizations to replace the pageant's top leaders. The parent group has terminated or declined to renew the licenses of several state organizations and is shopping around for a potential new home elsewhere in the country after spending most of its nearly 100 years in Atlantic City.